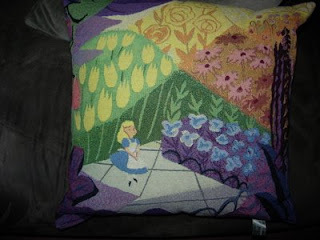 This is a pillow which features artwork from Walt Disney's "Alice in Wonderland", by famous Disney artist Mary Blair. Mary Blair worked on several Disney features as well, including "Cinderella", "The Three Caballeros", and "Peter Pan". The artwork featured on this pillow was inspired the backgrounds which were used in the "Golden Afternoon" scene in the movie.